My parents came down from Quebec for the weekend. It was a coincidence that if was Mother’s Day weekend but it was a good coincidence. Two years ago, on one of my mom’s previous visit we sewed a quilt top together. It had been waiting to be finished all this time. 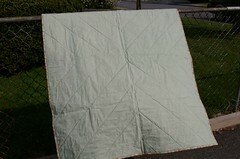 After taking my quilting class I finally knew how to finish it properly. So I decided to finish the quilt and give it to my mom for Mother’s Day. Last weekend I quilted the quilt and prepared the binding. Then last Friday, I sewed the binding on. I sewed both sides of the binding with the sewing machine since I didn’t have time to hand-sew. It didn’t take really long to finish it and before I knew it I had a finished quilt! The next day, just before my parents arrived the sun came out and I was able to get some nice shots of the quilt. Some of the fabrics I used were bits of fabrics that my mom had used in some of her projects and some were fabrics that I had in the stash. I’m really happy how the colors go so well together, a blend of pinks and greens. 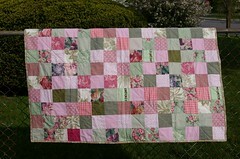 I used a cotton batting so the quilt is very light and thin and will be nice for the summer. I know that it will be well loved by my mom. It’s so beautiful!!! I’m sure your mom loved it. And how great that their visit turned out to be on Mother’s Day Weekend. Hope you all enjoyed it! Gorgeous – perfect colors for a summer quilt. Your quilt is beautiful, I love all of those colors together. What a lovely quilt. And a lucky mom! Wow! 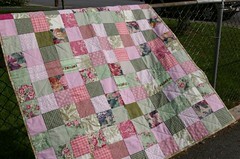 The quilting is perfect for the quilt. Well done! What a beautiful gift! The pink and green are my favorite colors. I’m sure your mom just loved it!